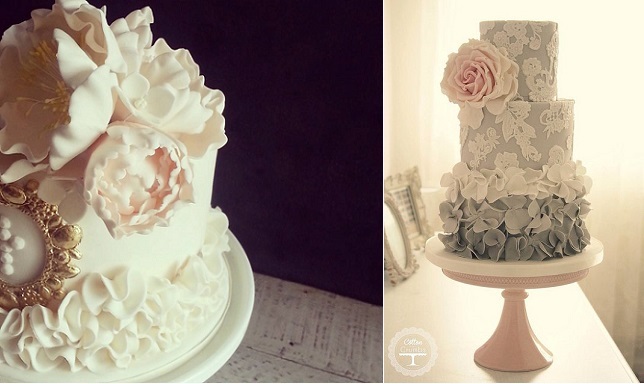 We have two superb examples above – from Australian wedding cake designers, Sweet Bloom Cakes (above left) and from vintage cake couturiers, Cotton and Crumbs, (above right). 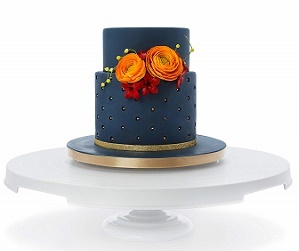 It’s a style of cake that works both with vintage lace accents, as in the Cotton & Crumbs designs above, or with smooth fondant and a floral arrangement, as showcased by the elegant design below from Sugar Couture Cupcakes and Cakes. 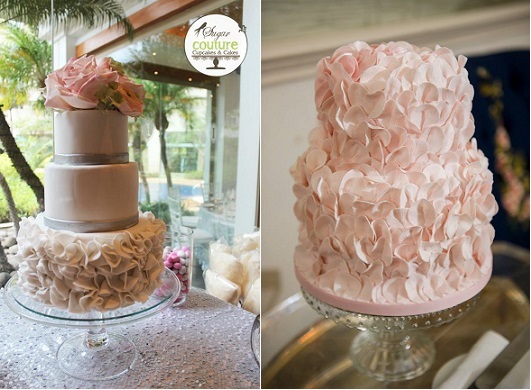 Below right, we have a second petal ruffles design by Sugar Bloom Cakes – with a beautiful texturised two-tier cake covered entirely in blush pink petal ruffles for an inovative cake design. 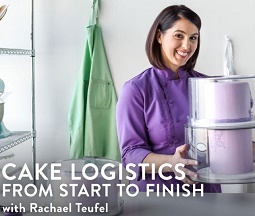 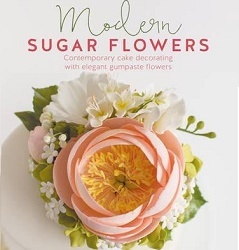 There are many ways to arrange petal ruffles on a cake. 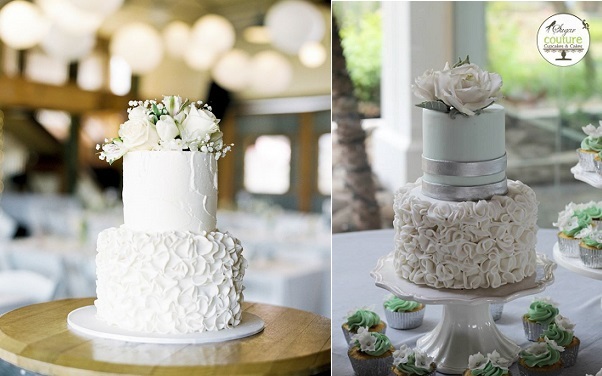 Two of the simplest are: softly ruffled as in the example below left (image by Bentinmarcs Photography via Style Me Pretty) or more tightly ruffled, as in the stylish mint and silver cake design below right, again by Sugar Couture Cupcakes and Cakes. 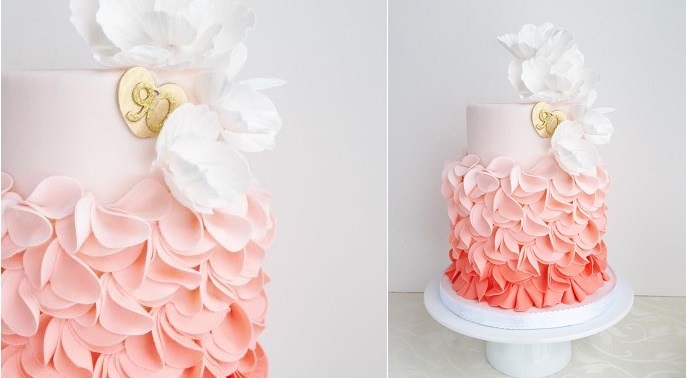 The Cake Whisperer have created the beautiful peach ombre petal ruffle cake below using clusters of overlapping petals for a luxuriant design. 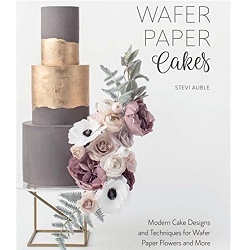 You’ll find a tutorial for this style of overlapping petal ruffles here from he Bloom Cake Company: petal ruffle cake tutorial. 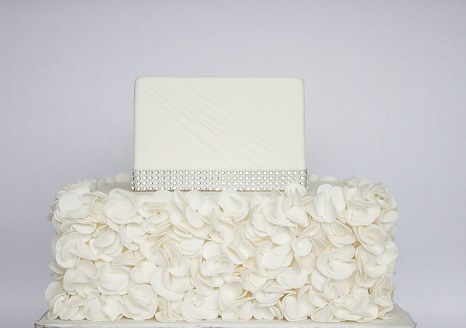 Our second design from The Cake Whisperer below features petal ruffles arranged diagonally on the bottom tier, edged with tiny piped pearls to enhance the delicate design. 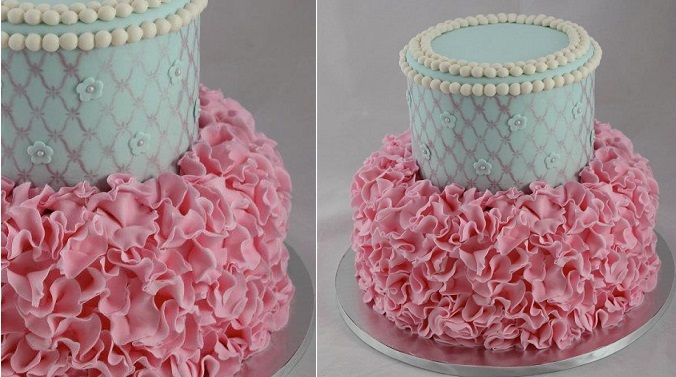 Extra frilling can be added to petals to give an enhanced ruffle effect with pink petals paired with duck egg blue and lattice detailing in the vintage cake design below by Canada’s, Sweet on You Cakes. 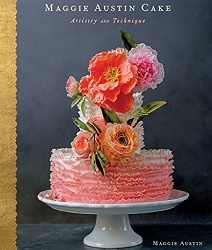 Sharon Wee, has created one of the most beautiful petal ruffle wedding cakes in her “Royal Wedding Cake” design, the top two tiers of which feature below left, showcasing an exquisite pairing of piped lace and petal ruffles, topped with sugarcrafted peonies. 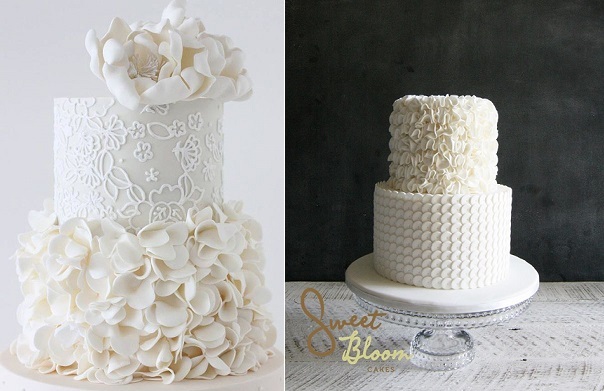 Below left, Sweet Bloom Cakes have designed another terrific petal ruffle cake, again incorpating mixed textures – buttercream piped petals on the bottom tier with fondant ruffled petals on the top tier. 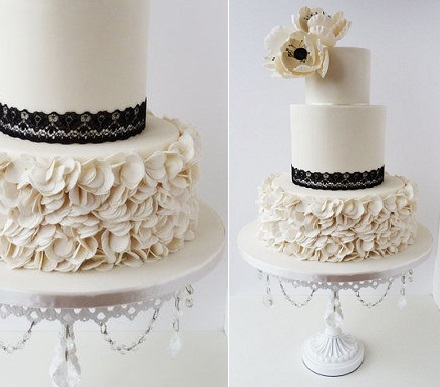 Scottish wedding cake designer, Suzanne Esper has created a fabulous petal ruffle wedding cake design below in classic ivory with black accents. 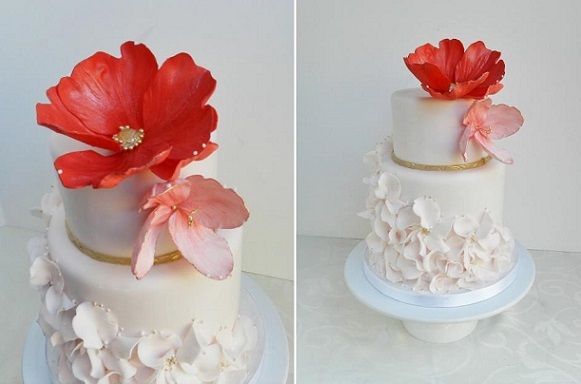 Beautiful sugarcrafted anemones offset to the side add a sophisticated final flourish. 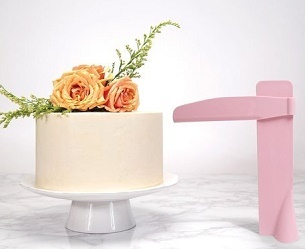 Old world piping and petal ruffles add up to make for a wow wedding cake design from Australia’s Yummy Cakes and Cupcakes with Patricia Hardjopranoto’s signature lustre finish that makes her wedding cakes so sought after. 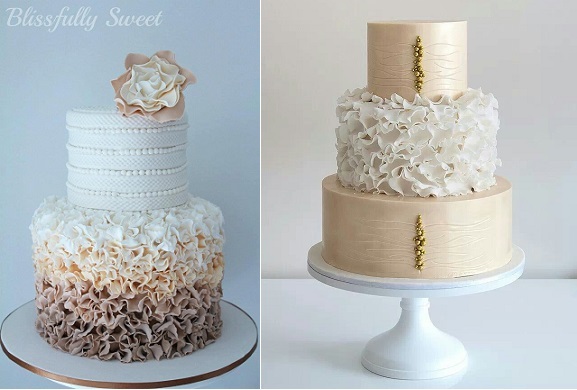 Blissfully Sweet Cakes have created the beautiful petal ruffle wedding cake below left in an exquisite colour palette of stylish taupe, beige, pearl and white, with a softly textured top tier. 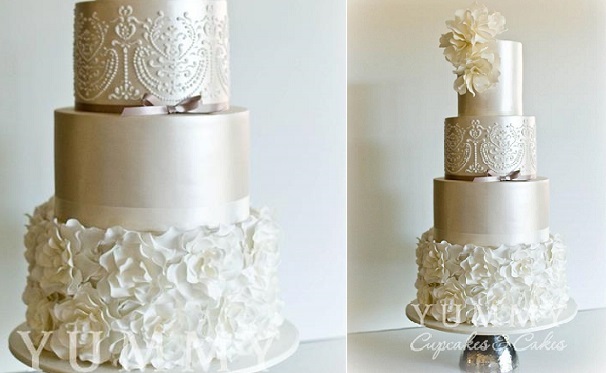 Finally, an elegant petal ruffle wedding cake in champagne and white with vintage gold beaded motifs by the brilliant Coco Cakes, Australia. 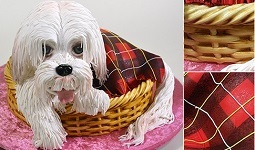 To help you make your own ruffle cake, we have some tutorials here to help you starting with a video petal ruffles cake tutorial by My Girls Cake Shop (as featured below). 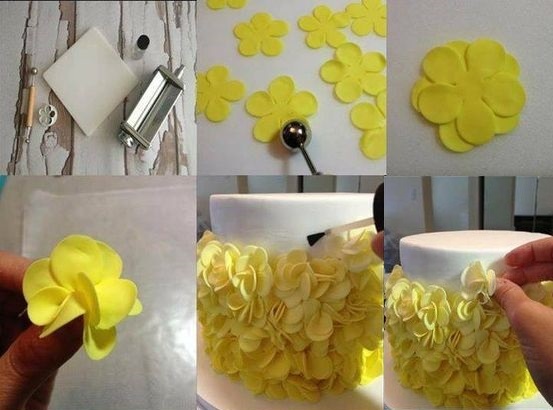 Charlotte Emily Cakes (formerly Let’s Eat Cake) have put together the quick reference petal ruffle tutorial below. 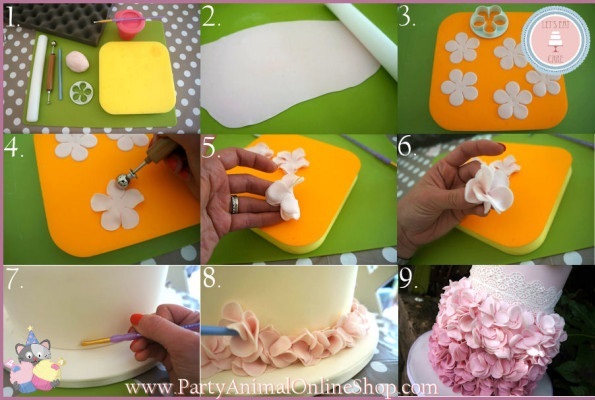 With another picture tutorial on how to create fondant petal ruffles from the Bloom Cake Company below. 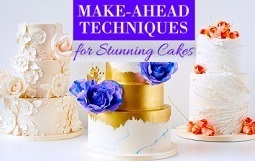 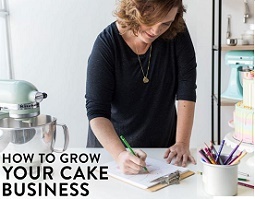 Advertisement: To learn how to create beautifully textured petal ruffle cakes and more fabric inspired designs, check out Marina Sousa’s cake class on Craftsy: Creating Designer Textures in Fondant. 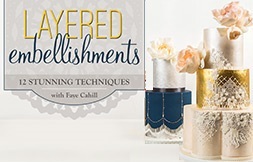 Readers might also be interested in Jessica Harris’ textured effects tutorial where you’ll learn how to create the four fabric effect designs below plus lots more textured effects in fondant. 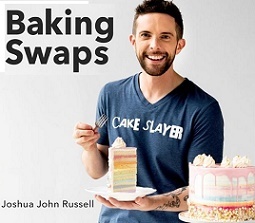 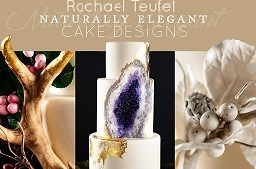 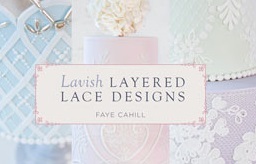 Check out Cake Geek Magazine on Facebook for more inspiration and design trends.